Every year, our local track club hosts a big shindig for our club members and it serves as a way to socialize with fellow runners as well as recognize some people who have volunteered several times throughout the year. While this is an annual tradition, this was my first year going. My boyfriend and I had planned on taking advantage of the amazing food catered by Chandler’s Deli (read: soul food)but didn’t want to go by ourselves so after a quick convo with Brittney I talked her into coming too. I told her about the heavenly food they would have and we both decided to get in a workout before going to the picnic. Turns out that was a fantastic idea. 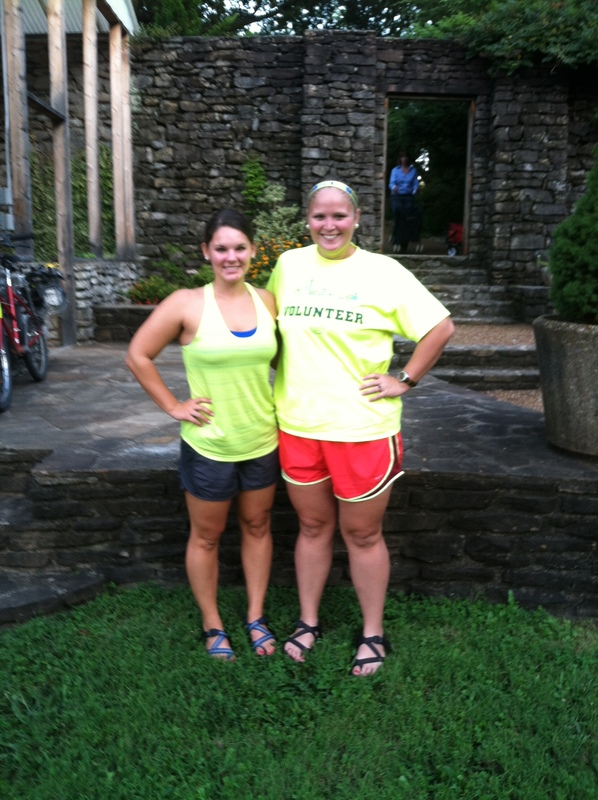 The picnic was the at Knoxville Botanical Gardens which was a gorgeous location but was smack dab in the ghetto. Needless to say we locked our doors on the drive there. After setting up camp with some bag chairs, we got a massive plate of food. Wait, massive is an understatement. 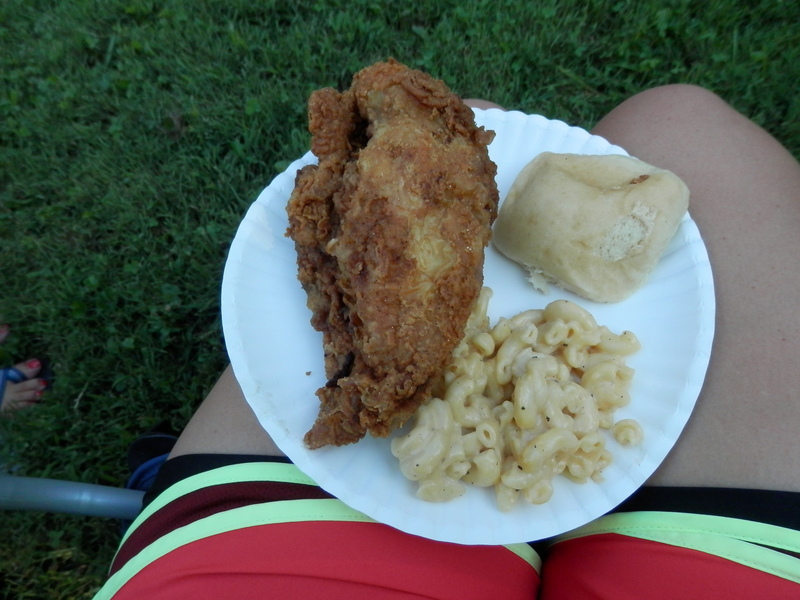 The fixings included fried chicken, fried catfish, mac n’ cheese, green beans, and rolls. I racked up and didn’t feel an ounce of guilt about it. The entire affair was very casual and informal. We don’t really know very many people in the track club so we mostly kept to ourselves but it was great to catch up with Brittney and chat about dream vacations, running plans, and future teaching careers. so happy to have food! 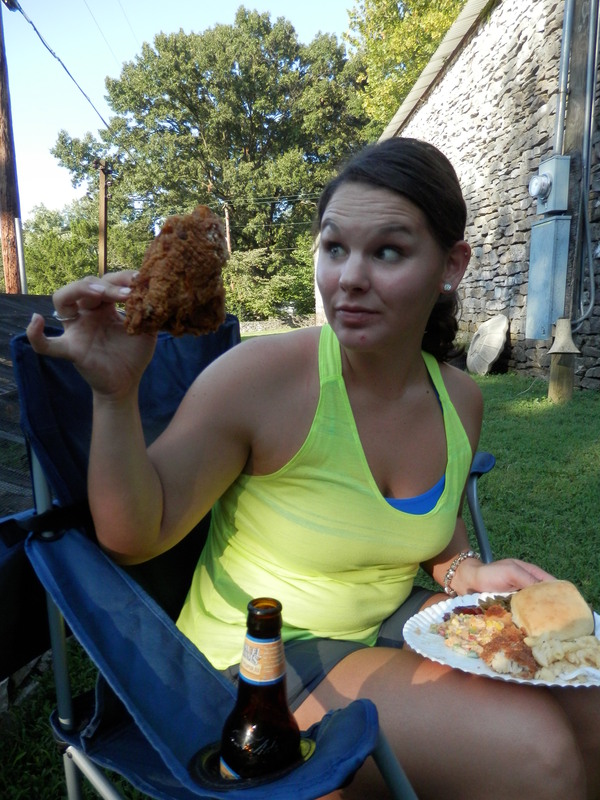 Brittney with chicken the size of her face! We enjoyed some fantastic food and great conversation. Since I volunteered more than 20 times with the track club this past year, I was rewarded with a KTC tshirt, polo, and amazing fleece line rain jacket. I can’t wait for winter so I can wear my awesome new rain jacket. It was a great night and I’m so glad we got to go enjoy good company and good food. 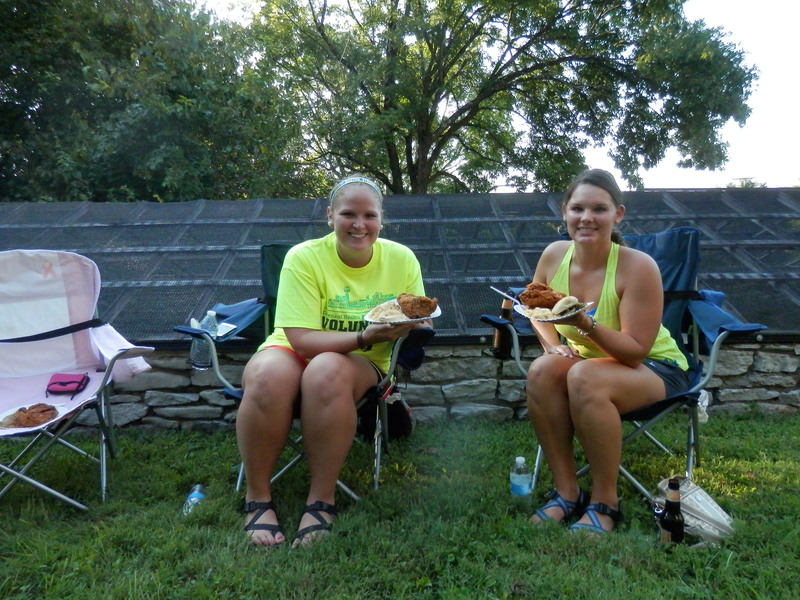 This entry was posted in Eating and tagged diet food, fried chicken, good friends and good food, knoxville track club, runner's picnic by thegogirlblog. Bookmark the permalink. Mac and cheese just isn’t complete without fried chicken! It was so delicious. So good catching up! The food was so good, we will definitely have to pencil this event in for next year, only I most certainly will have more volunteer hours! Glad we got to see you!! And yes, next year you will be getting the coveted jacket!